I was hired by a friend to take some photography for her in Zheng Zhan Lun music showcase performance at The Esplanade Recital Studio last Friday night, 31 Oct 2008. The event was organised by TCR aka 弹唱人. My friend plays bass in the live band. Zheng Zhan Lun (郑展伦) a.k.a. Ken Tay is an active figure in our local music, theatre and broadcasting scenes, Ken has released his own albums, singing some of the best Mandarin classics of our time (including such songs as My Love Will Fill Your Loneliness , and If You Happen To Be Thinking Of Me , acted in plays such as the English and Mandarin versions of Private Parts , Army Daze , I Have a Date with Spring and If There’re Seasons , the Beauty World musical, local war-drama serial, The Price of Peace , worked in local radio, been a judge in singing competitions such as Channel U’s Superstar talent contest, and performed a concert dedicated to xinyao (新谣). 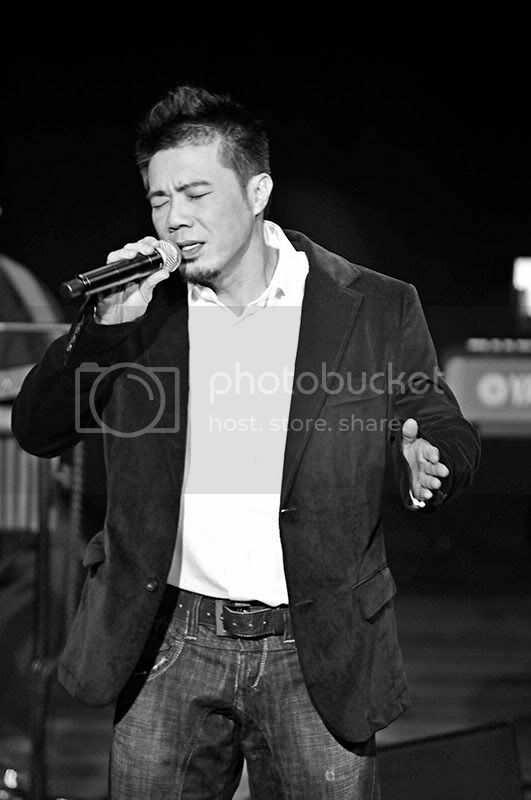 To view the photographs of the concert, please visit my website here. In September 2008 issue of Black & White Photography (UK edition) magazine, I came across André Kertész: On Reading. André Kertész (1894–1985) is recognized as one of the world’s most significant and influential photographers. André Kertész: On Reading is a collection of 104 black-and-white photographs that highlight Kertész’s signature style of the visual poetry in everyday life. The photographs were taken during a 50-year period, beginning in 1925. By capturing individuals immersed in the act of reading in a variety of settings—parks, cafés, libraries, rooftops, backstage, street corners, trains, and bookstands–, Kertész uses the activity of reading as a constant motif for his narrative, which weaves in and out of public and private spaces. These observations form an engaging, and often amusing, study of the universal and captivating power of reading. Upon reading and seeing his work, I was really inspired and thus I started out my own street photography project based on the same title. Though I can't compare my work with the great master amd not to mention of cliche photographs or being a copycat, nonetheless, I hope at the process of this project I would be able to develop a photographic signature style of my own, where my photographs create a strong visual communication to all viewers. Here are 2 shots for viewing. To view more in my On Reading collection, please visit my website here. Thank you. 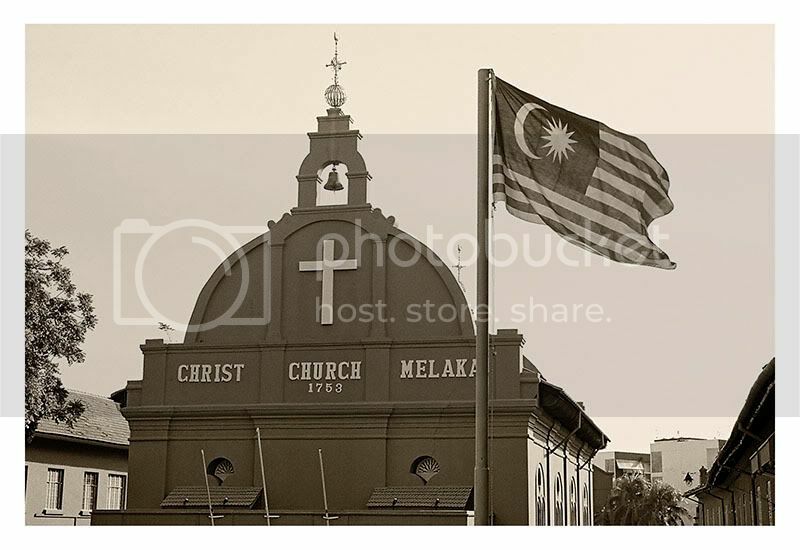 © Martin Liew Photography. All rights reserved. Every little thing cost money and prices are rising everywhere. Today more ERP gantries in operation and it affects many people's businesses in some ways or another. In this period of time, most people would cut cost and trying to save as much as possible. but there are people who brain-stormed to get their business going with attractive promotions. 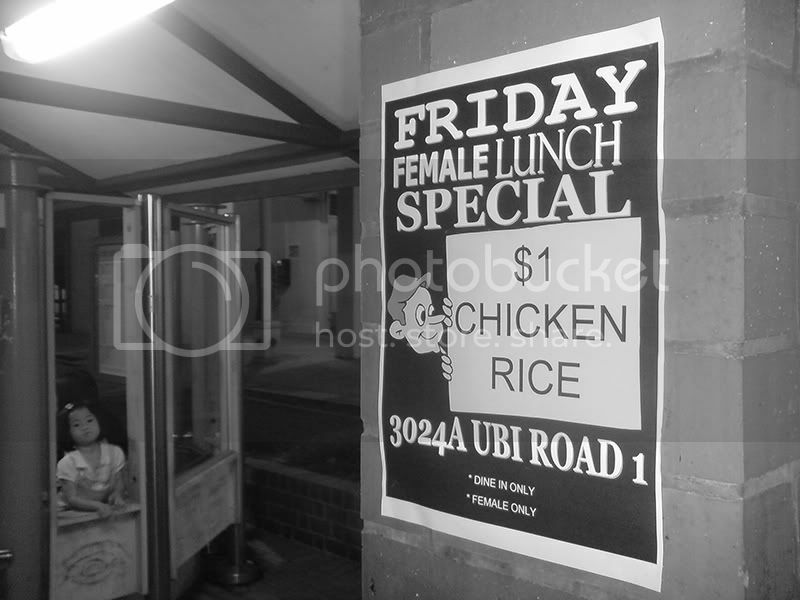 This evening I came across this wall poster pasted on one of the bus-stop pillars - offering chicken rice at $1, only for ladies on Friday. Lucky for women, but what about men? 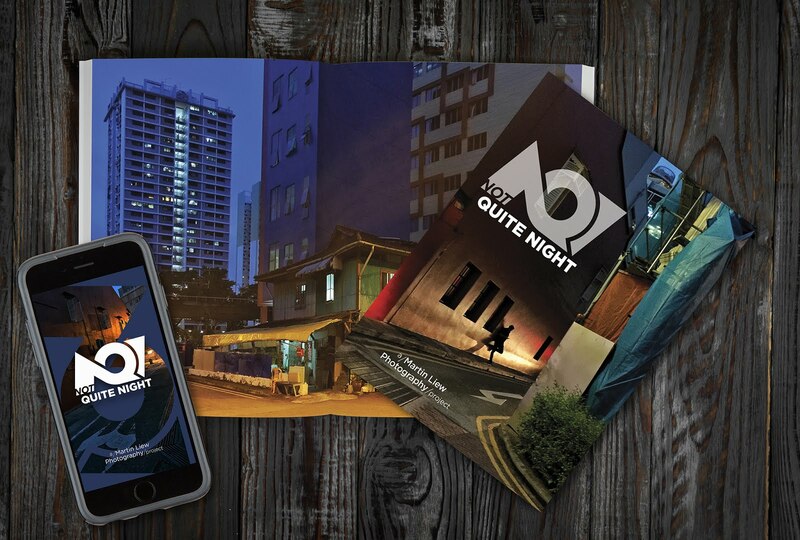 The guys at Nan Yang Folk Culture in Penang started the 24-hour year end photography project which later on was brought over to Singapore by Eye e City committee with the same idea. 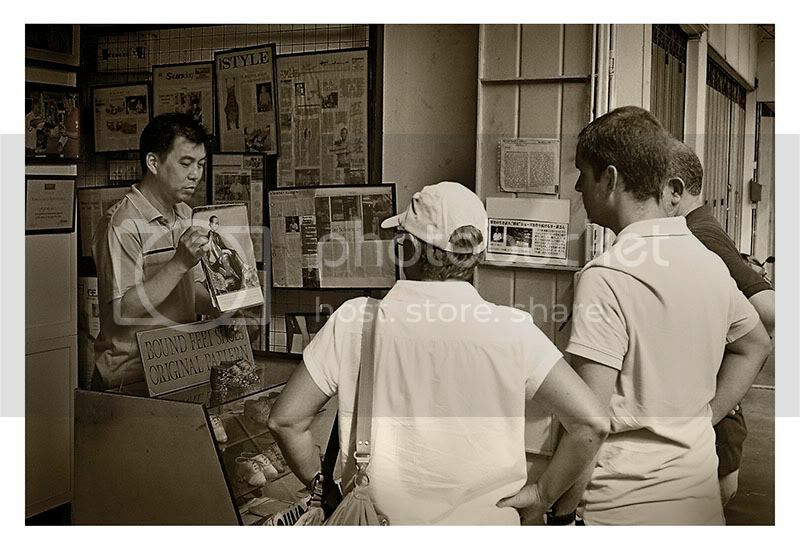 NYFC has shared with us on their past photography projects and a brief introduction and tour of Penang and its rich local culture, especially on their local Chinese heritage. Frankly speaking, it was my first trip to Penang and I didn't know what to expect despite of the program highlights. Therefore I just relax and enjoy, and let nature take its own course. Penang Island is an island off the west coast of Malaysia. It is located within Penang State, one of the smallest states in Malaysia - the second smallest state in Malaysia after Perlis. The name "Penang" itself comes from the colonial (Malaysia was under the British rule until 1957) way of pronouncing the original Malay name of the island, Pulau Pinang. The capital of Penang is George Town. We took a 10-hour plus coach journey on 5th June Thursday night. Upon arrival at the local hotel on the next morning, we took some time travelling around Penang streets, free & easy on our own before meeting our "tour guide", Yeow Wooi. He's the man behind NYFC. Yeow Wooi took out spare time to show us around his office, his photography work and talked alot on local Chinese heritage and history. Though we were all really tired from those walkings under the super hot weather and of course lacked of sleep in the coach, we were still pretty excited to find out more about Penang and to take street photographs too. In the night, we took off to attend the sharing session at Yeow Wooi's office, in a cosy meeting room. 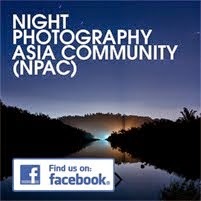 We got to meet many other Penang photography enthusiasts and artists as well. On the second day, we travel free & easy on our own again, in smaller separate groups, as we did not want to end up with everyone taking the same subjects. In the night, we went to attend a festive cultural show in conjunction with Dumpling Festival (端午节), held in one of the local Chinese temples, Da Bo Gong (大伯公庙). In the show, there are dances and music performances and lessons on the temple history and origins of Dumpling Festival. The show attracted many nearby local Chinese residents. The show was a success and the organiser is planning to stage another festive show on this upcoming Hungry Ghost Festival (中元节) in early August. We left early on the next morning, and yes for yet another great ordeal i.e. 10-hour plus coach journey. Well in fact we got a detour to Kuala Lumpur, just to drop 2 passengers. Traffic there was chaotic and fortunately we got our of the place soon. Howsoever, we had to travel south towards the Causeway, where we got stuck in a serious traffic congestion for more than 2 hours. Eventually we reached back home safe and sound. Home sweet home! 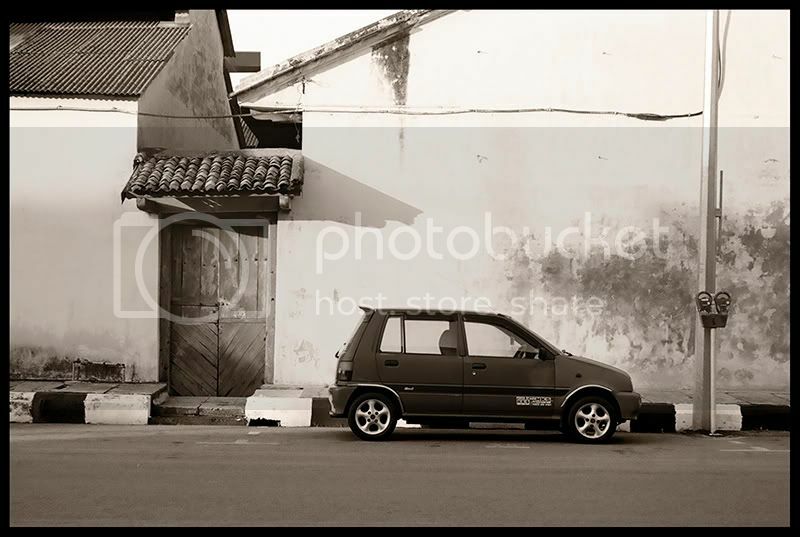 Shown below are a few photographs I took of the streets. 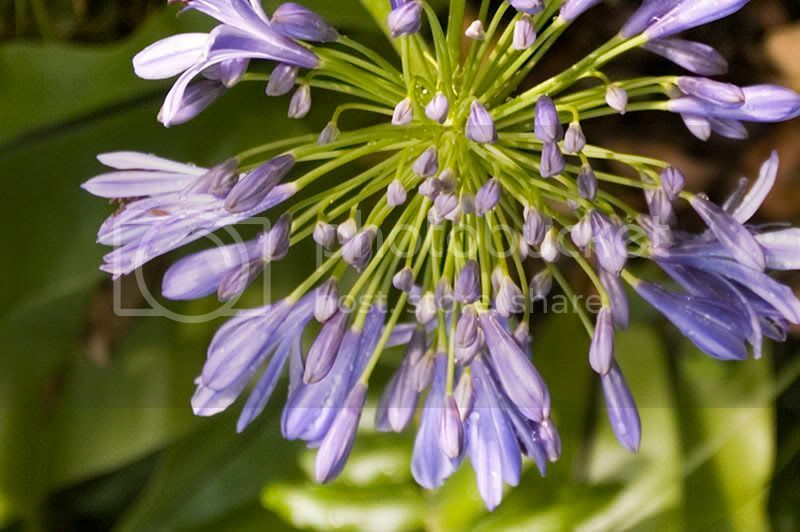 If you want to see more, please visit my website here. 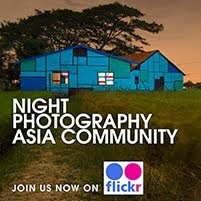 Would love to go back there for more other interesting subjects. Enjoy. 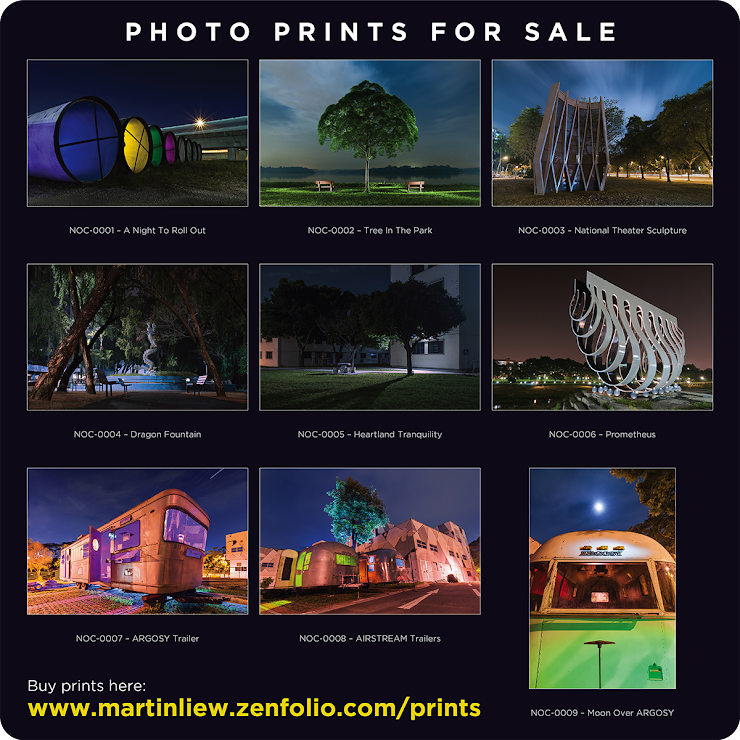 All photographs shown here are solely copyright of Martin Liew. 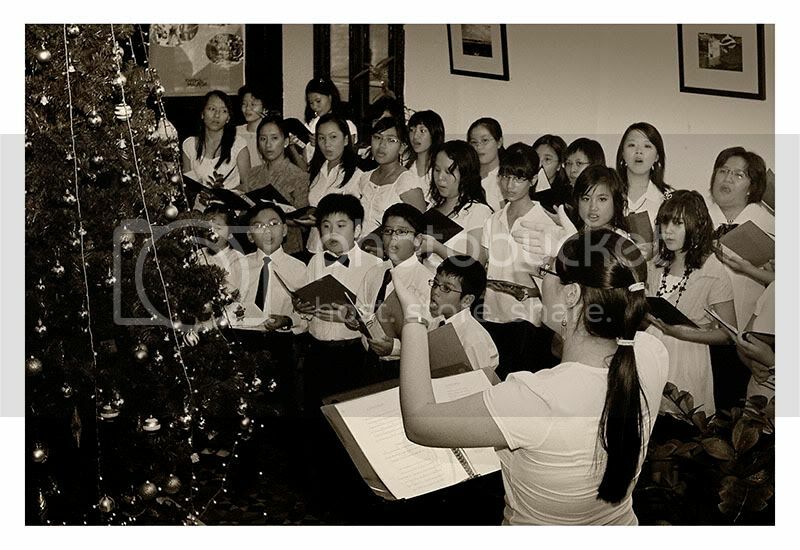 © June 2008 Martin Liew Photography. All photographs were made with a Seagull 205 RF and a Konica Minolta point-&-shoot camera (which went dead after its first roll), on 1 roll of Kodak TMX400 and 3 rolls of Kodak BW400CN. Negatives are developed & scanned. Post-processed in Adobe Photoshop CS2 using Channel Mixer and simple Dodging & Burning techniques. For warm tone, I used tinted sepia toning. 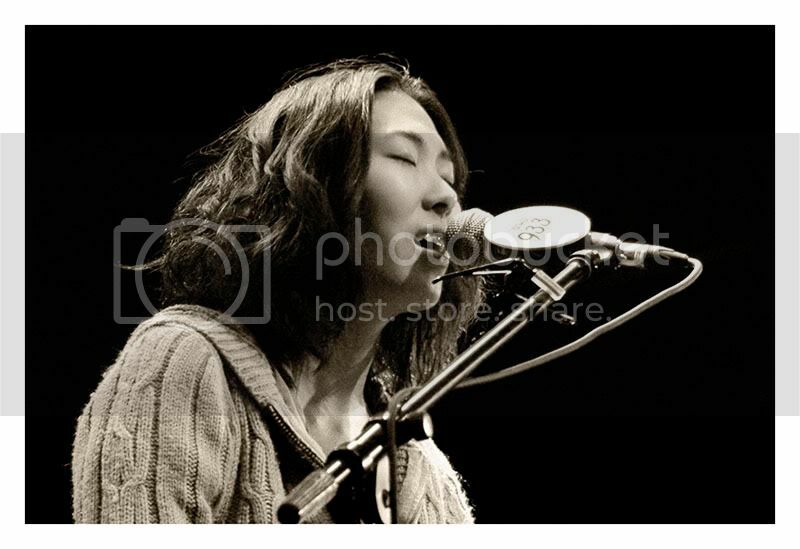 The voice of Joanna Wang arrives to warm up the spirits of music lovers at Lunar @ The Cannery on 25 April 2008. 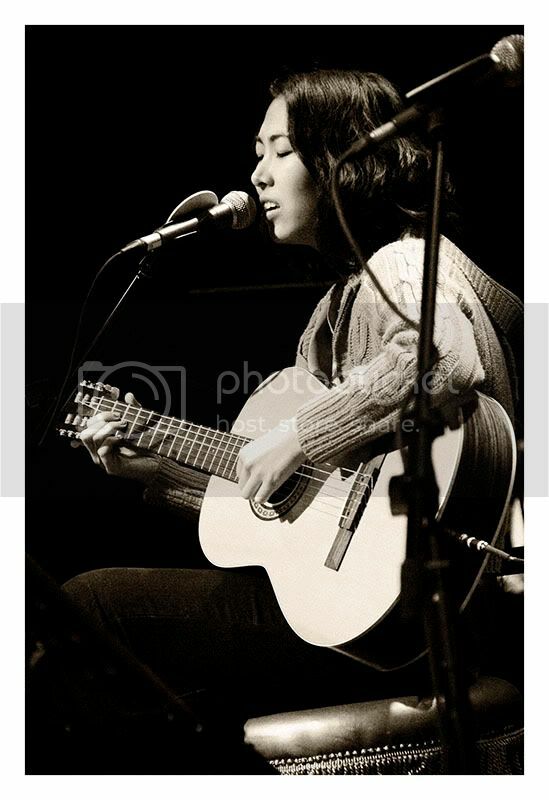 Joanna has been gifted with unique jazz vocals that have earned her applause since her early teens. Now at the age of 18 years old, she enters the music scene with her first full-length English album, Start From Here features 12 tracks including renditions of classics like Spandau Ballet's TRUE and Billy Joel's New York State of Mind. 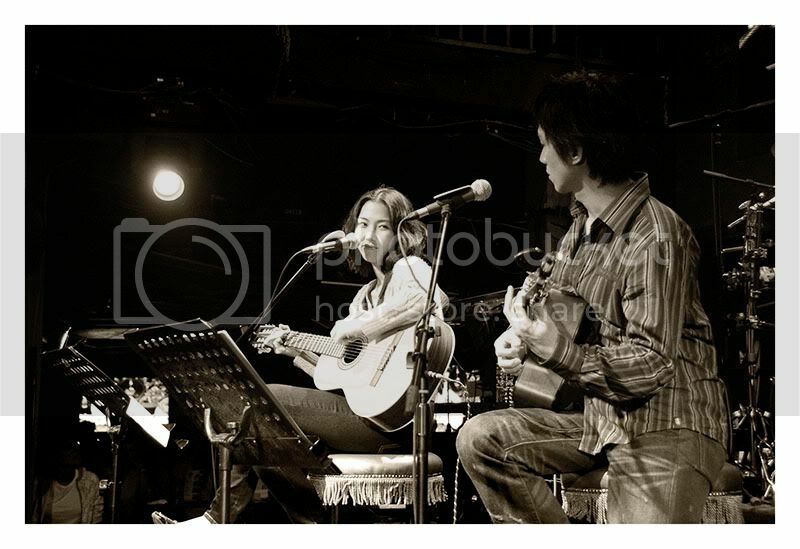 Also included on this release is I Love You, Joanna's take on David Tao's popular ballad Love is Simple. © April 2008. Martin Liew Photography. All Rights Reserved. 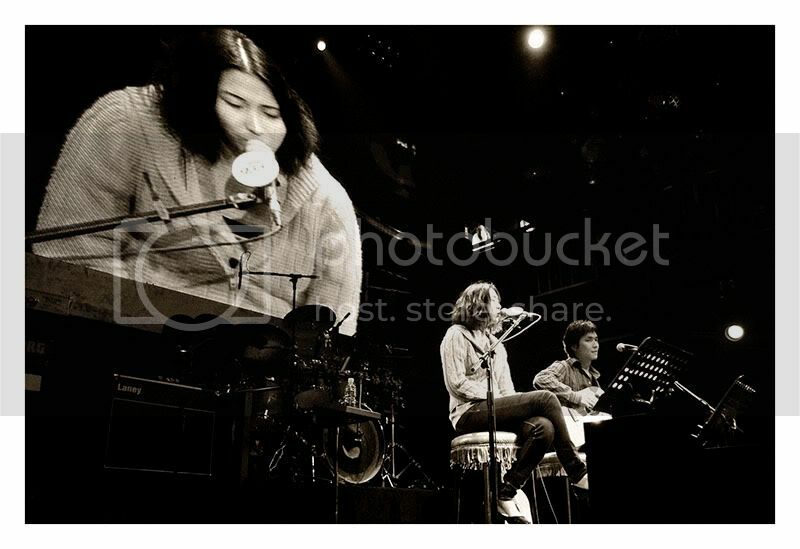 All shots are taken with Nikon D70s on Nikkor ED 18-200mm f/3.5-5.6G IF DX VR (Courtesy of Stan, Shi Wei). All flashlights are not allowed during the show. All color fotos are converted to B&W and duo-toned in Photoshop. Well I've never do this before and I'm doing it out of fun. So here it goes. 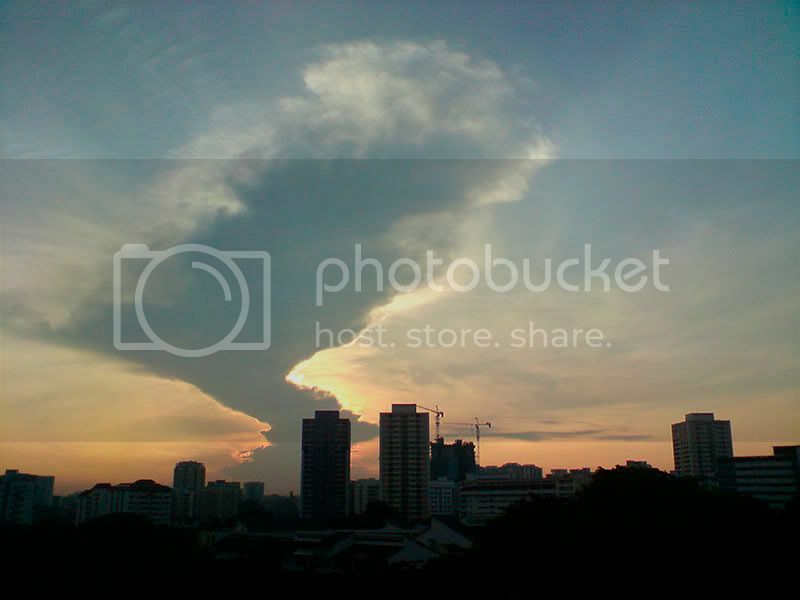 Took a few shots for the past 2 days with my 5mp Sony Ericsson cell phone camera and these are what I got. Yesterday morning as I opened the house door, I was greeted with such beauty before me. I can't help myself but to grab my cell phone and capture it. Later on I left home for work, I had breakfast at this coffee shop, where they still charge 70cents for a cup of hot coffee. Since Tuesday 15 April, some coffee shop owners have had marked up the hot drinks price. I paid 90cents for a cup of hot coffee. Well I did have a good breakfast, a fulfilling one. Well I'll try to take as many street snapshots with my phone camera as I can. Thay way I will not be missing any good shots, even though the result quality is not ideal. At least i get to take fotos and develop it as a daily focus discipline. I just received an email from a fellow Eye e City committee member who posted a thread regarding this documentary film, Annie Leibovitz: Life Through a Lens. It'll be showing in the upcoming 21st Singapore International Film Festival, starting 4 - 14 April 2008. For more details on the featured films, here's the agenda. 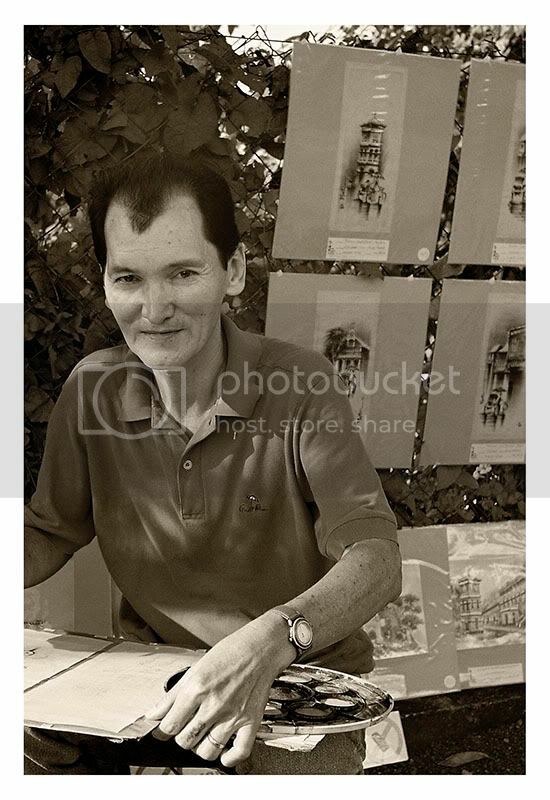 I've read about the film synopsis and have checked out on Annie's photographic work online. And I must say, her work is so unique. 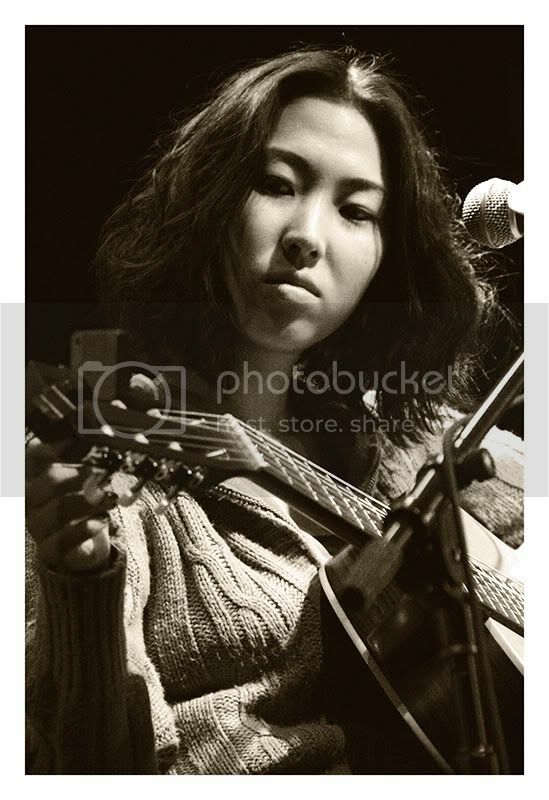 You can check out more of her photo gallery as well as her biography on Google Search. This documentary about Annie Leibovitz, directed by her sister Barbara who gives the viewer a deeper insight into the woman who has produced some of the most iconic images of the last 30 years. Barbara Leibovitz's smart documentary piece on Annie follows her evolution from art school student to one of the most influential American photographers today. Annie worked as the chief photographer of Rolling Stone in the 1970s; her shift to portrait artist for Vanity Fair provides the timeline for the film. She has shot the rich and famous, the scholarly and powerful, the prodigious and notorious. Her versatile subjects, be it rocker Keith Richards, Arnold Schwarzenegger or Hillary Clinton, are universal in their praise: when she is allowed to follow someone, she comes up with beautiful and illuminating shots. Her camera has also captured the horrors of war in Sarajevo and Rwanda. Consummate at exposing her photographic subjects, Annie's own life has been private and shielded. In this film, the viewer gets to follow her on a personal journey and how she balances fame, family and the camera. Barbara visits Annie at the family's rural homestead, amid the latter's hectic work on a new photographic collection. She begins to reveal, on-camera, the many layers of her sister's personality and world view. The viewer will experience Annie's current work; her losses as well as her achievements. Her private life -- uncontrolled drug abuse, a relationship with Susan Sontag, raising three children as a single mother -- is touched on in Life Through a Lens. Another gripping documentary film, 33 Days, directed by award-winning Palestinian filmmaker Mai Masri. Mai takes us beyond the cold statistics and muted news stories and right into the gritty reality and the incredible courage demonstrated by the victims of war. Filmed during the Israeli war on Lebanon in the summer of 2006, 33 Days features the real-life stories of four people: a theatre director working with children who took shelter in a theatre after their homes were destroyed, a frontline journalist for an underground television station, an aid worker who coordinated emergency relief efforts for thousands of displaced people, and a newsdesk director trying to cope with her new-born baby amid the destruction and chaos around her. Through their creativity and courage, the film tells some of the untold stories of the survivors in Beirut. OK I know this is not about photography but it's about film shows. So if anyone is keen in watching these 2 films, do let me know asap. I'll be booking the tickets soon. Hear you soon. Just want to share 2 of my Holga fotos which I took last month on the 17th. 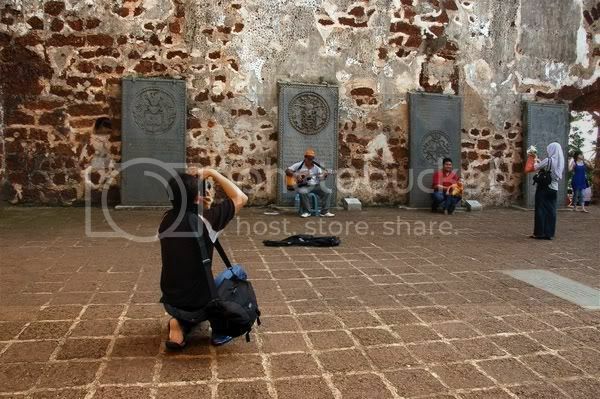 It was an organised outing with about 20 participating shutter bugs, taking turns to shoot on 3 models. The 2 young models here are Michelle and Pei Ling respectively. Obviously I missed out the first model, Angeline. In my own practice, I would usually talk to my subject, and try to get to know them better in a way or other before starting to take their pictures. 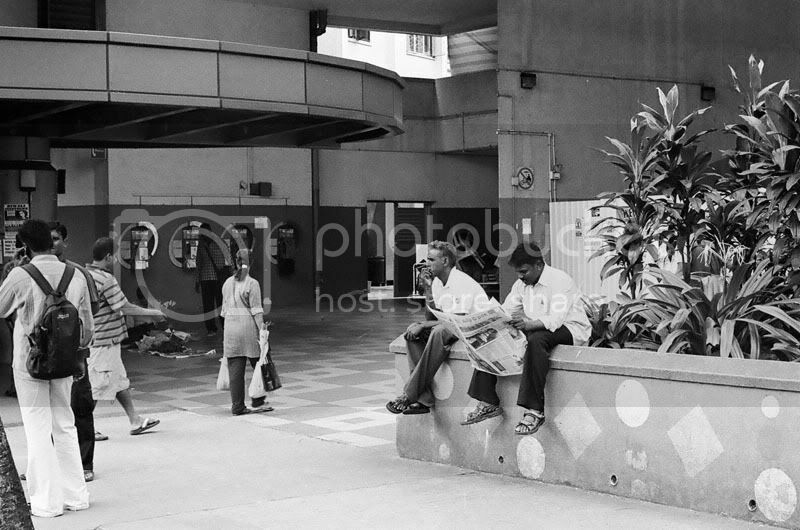 Taking a good example on my photography session with Mr Mohan outside the National Stadium. In this case, I didn't do what I supposed to do but just went ahead taking numerous shots with my DSLR. Until at a certain time, when I think I'm ready to use my Holga, as when the models are more warmed up and knows what to expect from me, presumably. Somehow I still find there are something lacked in these fotos i.e. self trueness. Overall these images are still acceptable, passed on merely as snapshots taken with a toy camera. 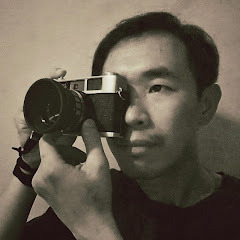 Holga camera is famous for its bokeh (a photographic term referring to the appearance of out-of-focus areas in an image produced by its plastic camera lens) and strong vignettes. The camera model I used is the latest range with its lens made of glass (120GN). 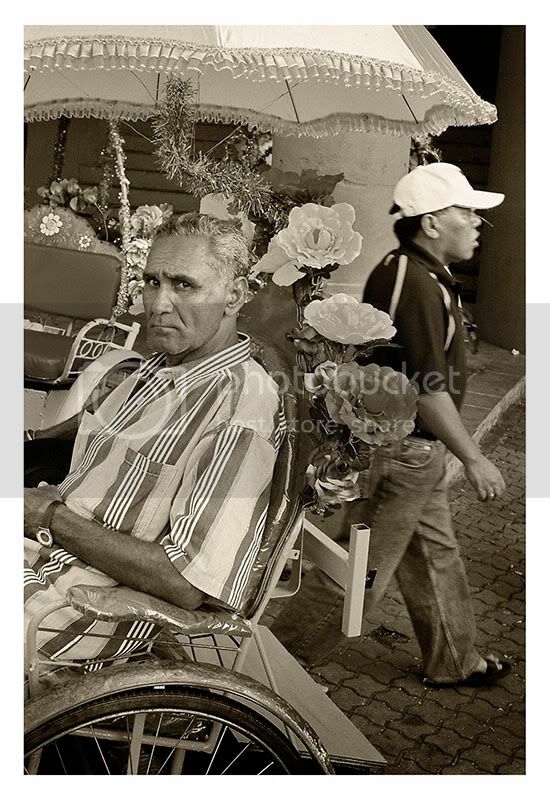 The strong vignettes that Holga camera produces, certainly creates a whole new appearance to an image, which some people love it or just hate it. 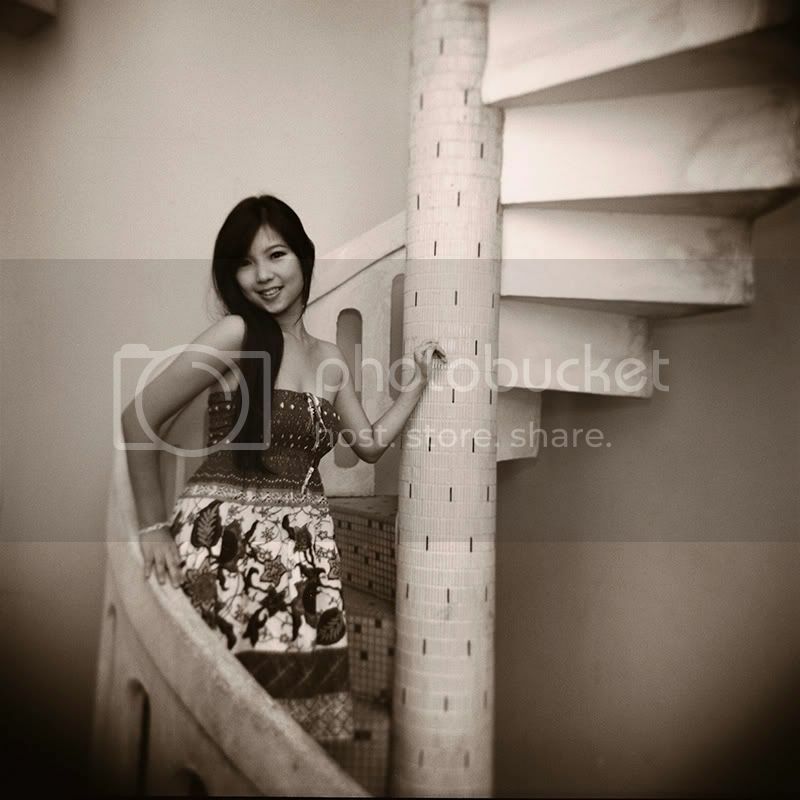 Comparing the bokeh between these 2 fotos, Pei Ling's image is more sharper than Michelle's. 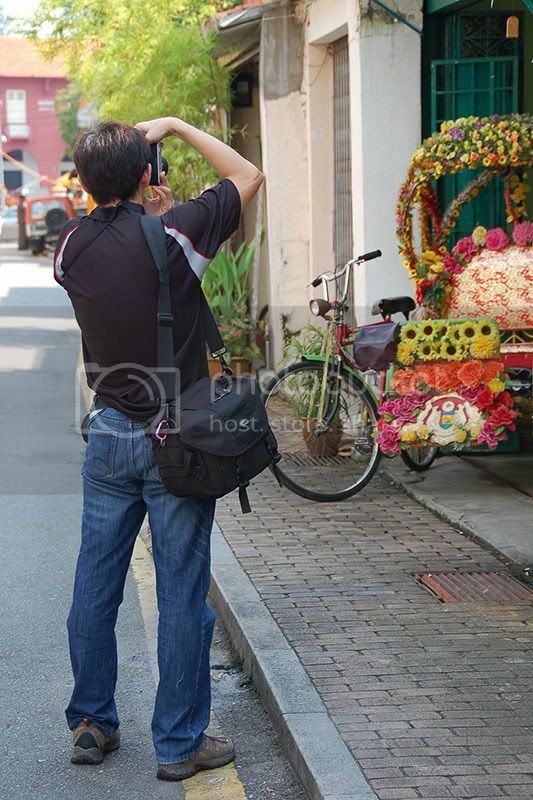 It all comes down to individual photographer's focussing distance judgement. Or unless I use a rangefinder lens to determine the actual focal distance and then adjust the Holga lens accordingly, which still in turn based on estimation and perhaps luck. Apart from the technical aspects, I did not spend too much time post-processing except retouched on blemishes and added a tinted sepia for warmer tone. 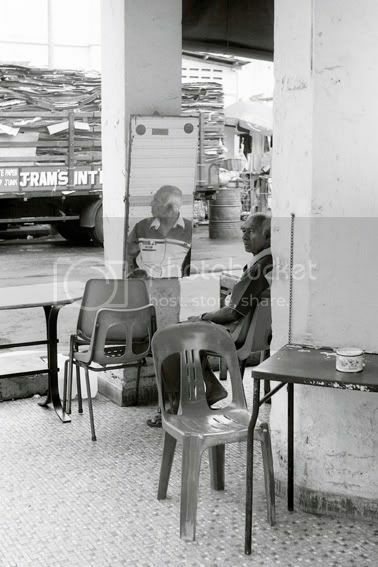 I got this street photo by chance during an outing in Little India circa 2005. If I remember correctly I shot with a Seagull 205 rangefinder with a fixated 50mm lens. I think the film used was Ilford FP4 Plus. I wanted to get even more closer to the old man, but he turned his head around as he saw my reflection in the mirror, approaching in his direction. Though the chair and table in the foreground are pretty distracting, somehow I think they serve as part of the elements in this photograph. It tells alot about the environment the old man was in. 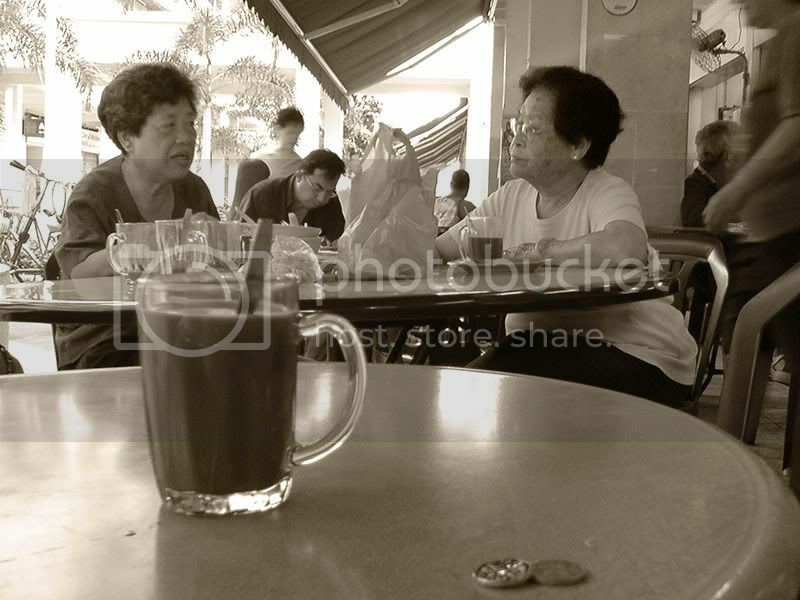 Actually they belongs to a kopitiam (coffee shop). The most important thing to me in this photograph is that expression the old man put up. As the blog title speaks for itself. I was there, witnessed those special moments slipping by and I wasn't able to capture them with a camera, but only with my eyes. My eyes kept blinking as if I have had taken many snaps of the beautiful scenes before me. This morning as I was moving out for work, heading my way towards Boon Keng Road, I have to use the CTE overhead bridge to cross over the other side. After completed the first flight of staircase, I saw before me two old folks; one old lady with a walking stick and behind her, an old man. They were taking every single step at a time with cautions, balancing themselves and finally reached the platform. I'm sure they are a lovely old couple. That very moment as I saw them climbing the stairs, with the bright warm morning sky and beautiful clouds formation, touched me deeply. I could have make a few good exposures. I stood right behind them, petrified. I took a clear look at that scene for almost half a minute. Well I smiled and blinked my eyes. That scene was captured in my memory and it's still vivid as I'm writing this. It really hard to come by this golden opportunity but what the heck! This is Life and I love it! Guess I spoke too soon. While waiting for my bus at the bus-stop, I saw an old man riding on a bicycle with a little boy sitting in front of him. The boy is cute with small little beady eyes. He was rubbing his eyes as if he had not sleep enough. I blinked my eyes again. Moment captured in my memory which somehow brought back fond memories. 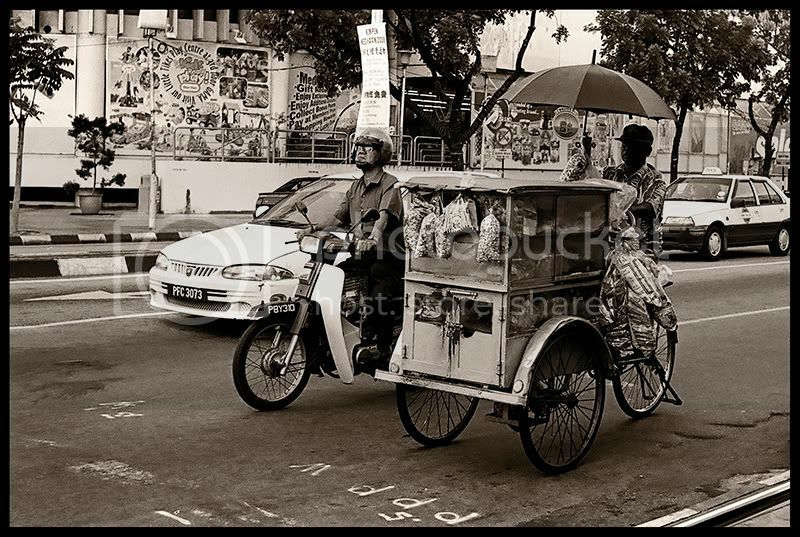 I remembered when I was a kid, I used to sit behind my Dad's bicycle every morning, riding all the way to Grandma's place at the old Kallang kampung area. Dad used to work there, in Grandpa's boat factory. How nostalgia! Next missed chance came along. My bus arrived and I took seats on the upper deck and there, sitting in front of me, was an Indian fellow with his headphone on. His hands pressed and held on it to listen hard to his favorite tunes. He rested his left cheek on his left palm and looking out the sceneries as the bus rode on. Those fingers, hand and side view of his face, somehow showed that he's indulged and engrossed in his own world. To me that moment was special. Well all I could do was to observe and see. 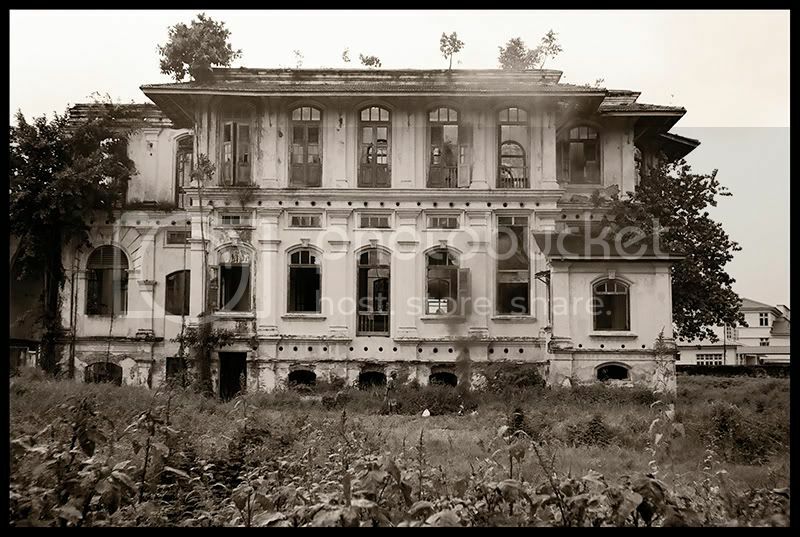 I'll look forward for a better tomorrow and better photo opportunities when I hit the street with my rangefinder camera. 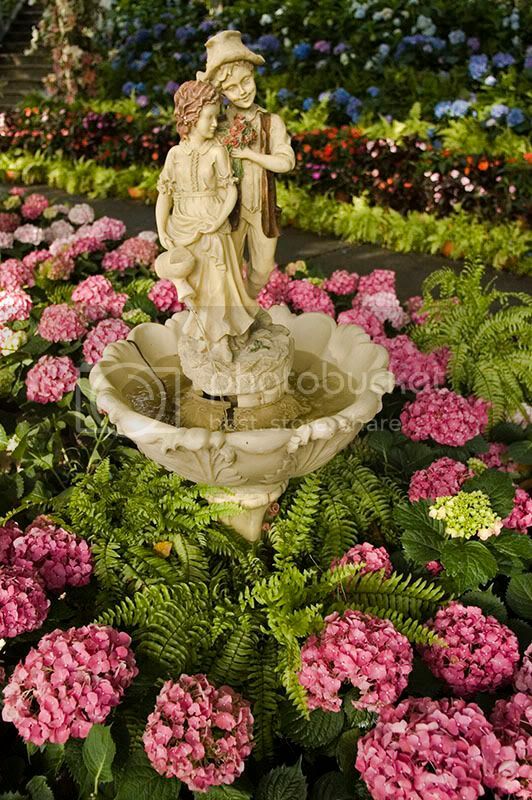 I was out with two of my friends at the Sentosa Flower Festival 2008 last Sunday, 10 Feb. I arrived really early at about 8:15am despite the Fest opens at 9am. I travelled by the monorail from VivoCity and alighted at Imbiah Station. 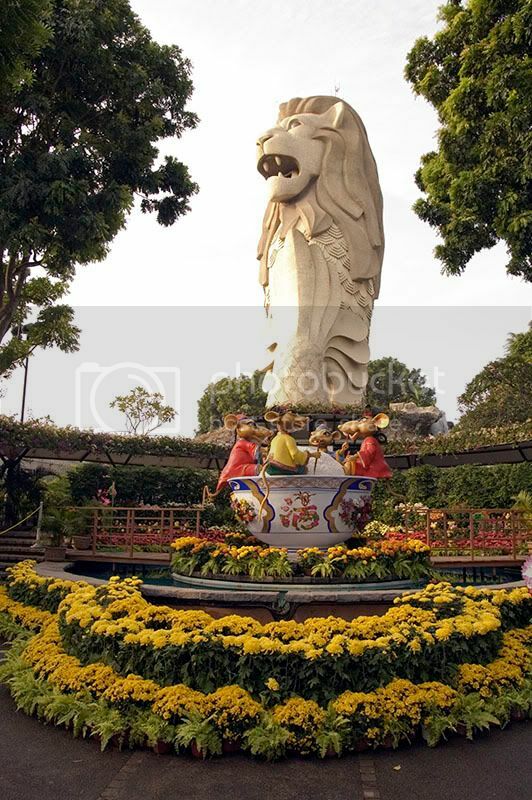 After looking around for a while, I decided to take my first shot of the gigantic Merlion structure and the floral decorations. Well one can consider this as a warm-up shot. I continue to explode around the area for more ideal subjects. 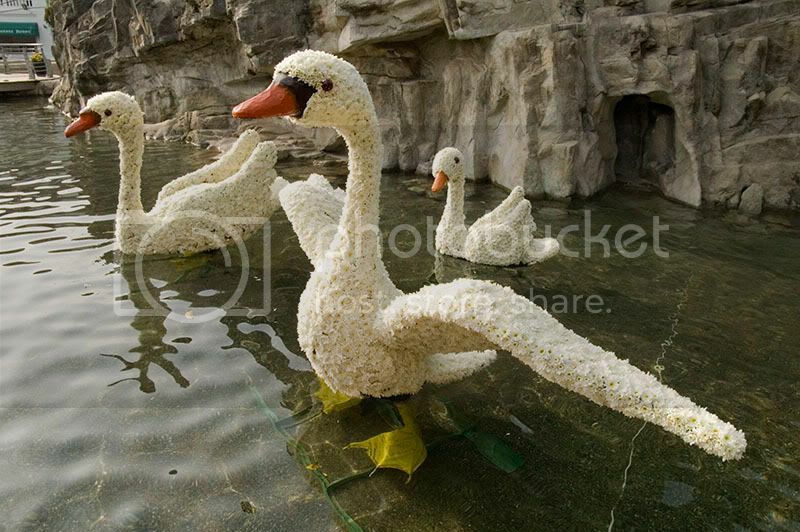 Then I came across these giant man-made swans which are made up of white flowers. Don't ask me of the flower name which I know nuts about them. Here's the shot I took. OK I do not own any macro lens. I took with me 2 lenses on that day i.e. Tamron 17-35mm f/2.8 and 50mm f/1.8. Yeah I know. Of cuz you think I had brought the wrong lenses there. 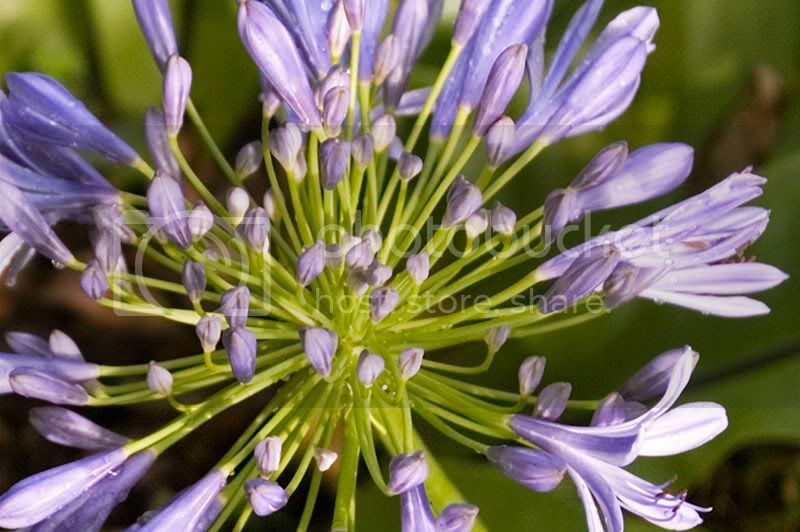 Well here are 2 close-up shots extracted from one single photo. Just playing around with different compositions. Well initially I wanted to take floral pictures but I don't wanna end up taking those same old flowers again as I had took in 2005. So I decided to look out for something different i.e. the people who visit the place. In the end, there wasn't any interesting subjects or scenes to take. So I took another still life shot of this water fountain. Well that's all I had take for that day with my Nikon D70s. I brought along my Seagull rangefinder as there's a roll of film inside, which contains shots from Malacca and Chinese New Year relative gathering on first Lunar New Year day. I'll post some of those photographs here soon. 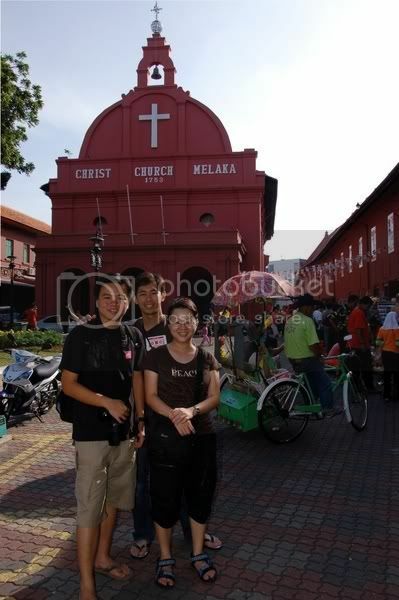 I went to Malacca last December, 2 days prior to Christmas Day, for a short trip with 2 of my friends. 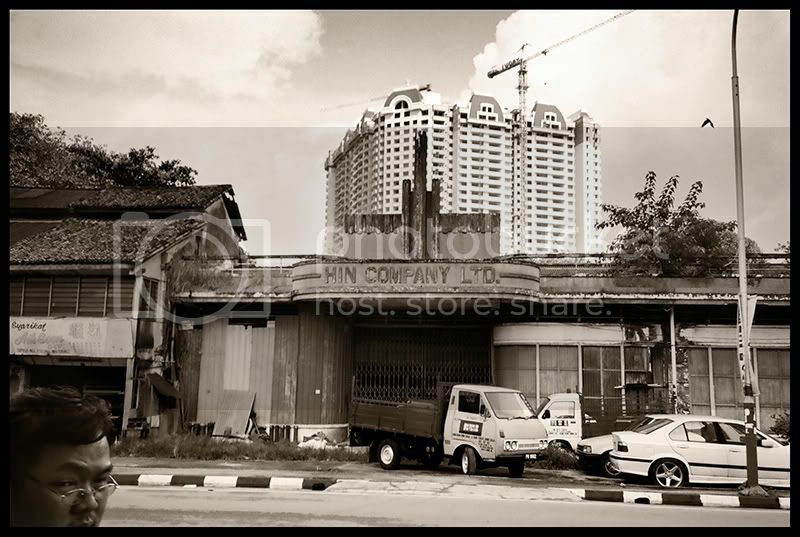 We booked one of the local hostel, Twenty Guest House, located near the entrance of Jonker Street. It was a 2 days 1 night stay. It meant to be a get-away trip for us all, and at the same time a photographic trip. I wanted to travel light so I brought my Seagull 205 Rangefinder and a couple of extra 35mm color negative films. Oh yes! I brought my HOLGA 120GN too, for some fun shots. So here are the street photographs I took on the color negatives. I'll update the photos from my HOLGA once ready. 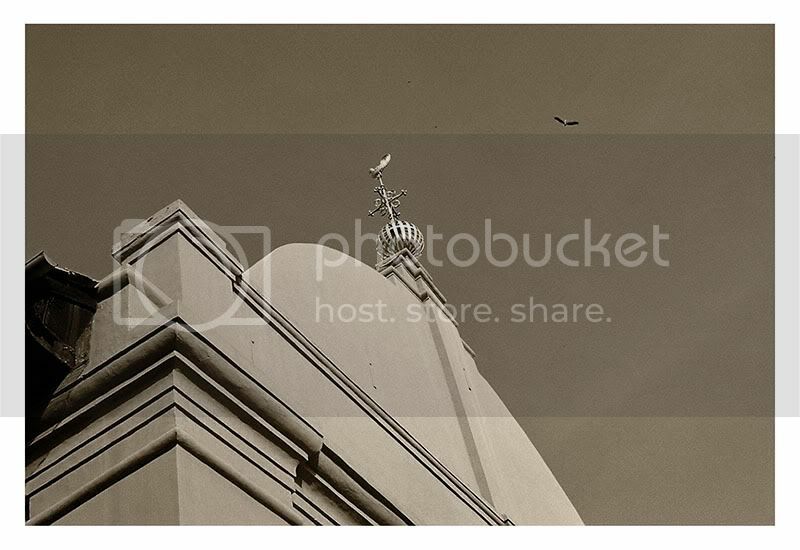 All photographs are scanned and converted to B&W with light sepia toning, in Photoshop. Hope u enjoy viewing them as much as I made them. After we had checked in the hostel, we were very hungry. We spotted one of the famous Hainanese Chicken Rice stalls with long queue and decided to try out Zhong Hua Cha Shi (中华茶室) on their famous chicken riceballs. They taste good - the authentic Hainanese chicken rice. Yummy! After the meal, we take a walk along the street, exploring the area for some good street photographs. The photo above is one of the first few photos I took. 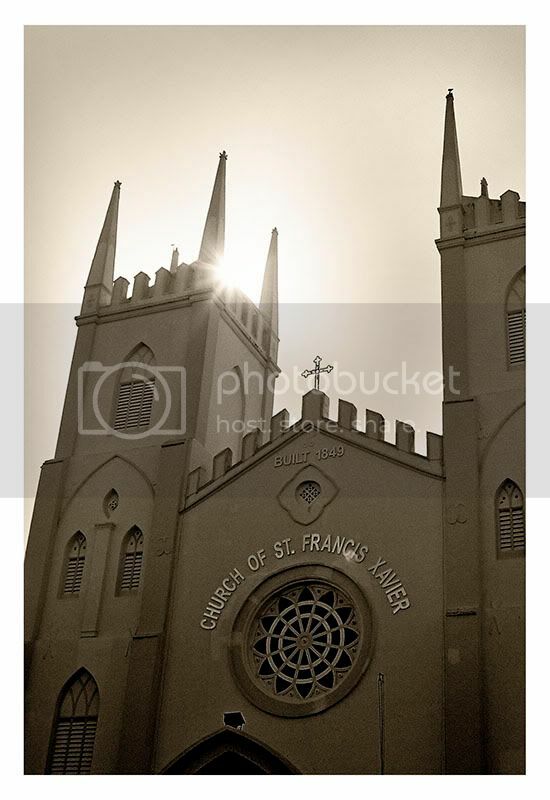 Though the weather was blazing hot, it provides excellent lighting for photography. 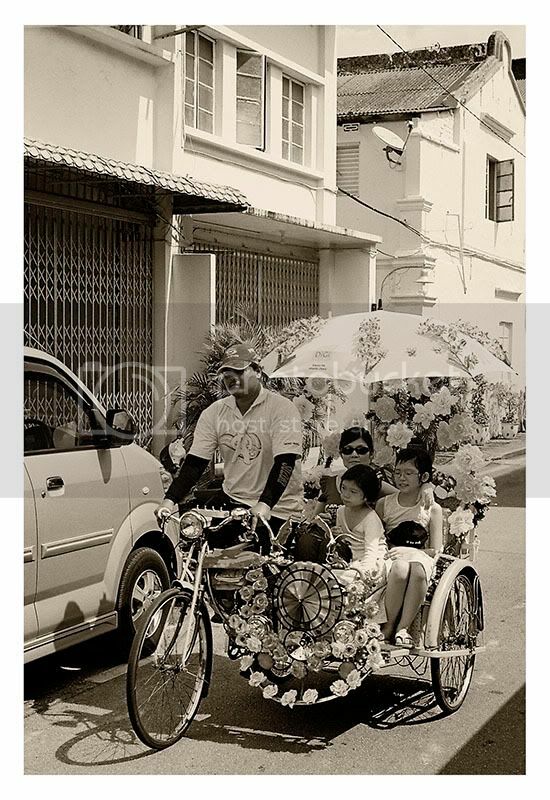 This is one of the famous tourist attractions - trishaw decorated with vibrant flowers. I was lucky to take this shot. We were walking along Temple Street and as I turned around my back I saw this trishaw rider was riding with his passengers, coming in my direction. Fortunately I had set my rangefinder camera in advance, so I lifted it up and snapped! This is the fun part of street photorgaphy, especially when using a rangefinder camera. Next, I came across this graffitti right beside a tattoo parlour. 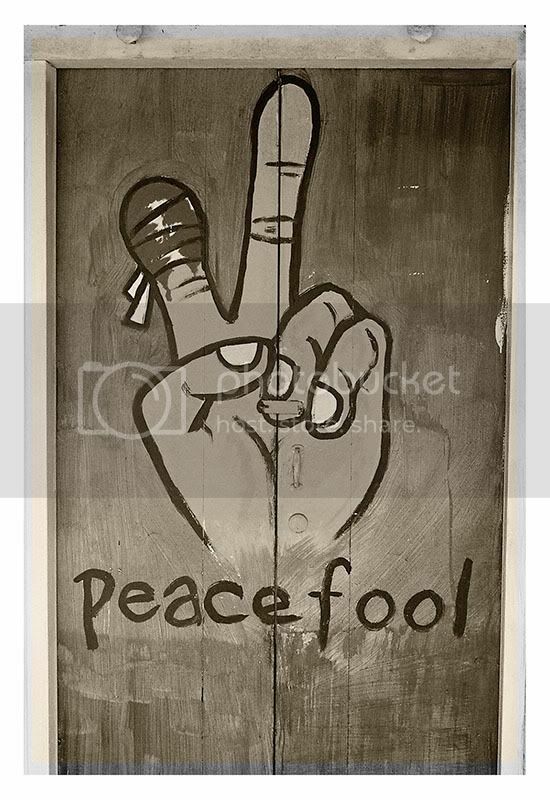 the wooden door was painted in green color, hand in yellow with the bandaged finger in red. I like the color combination as it reminds me of Bob Marley and a country flag colors. If you know or heard of Bob Marley, you'll know what I mean. 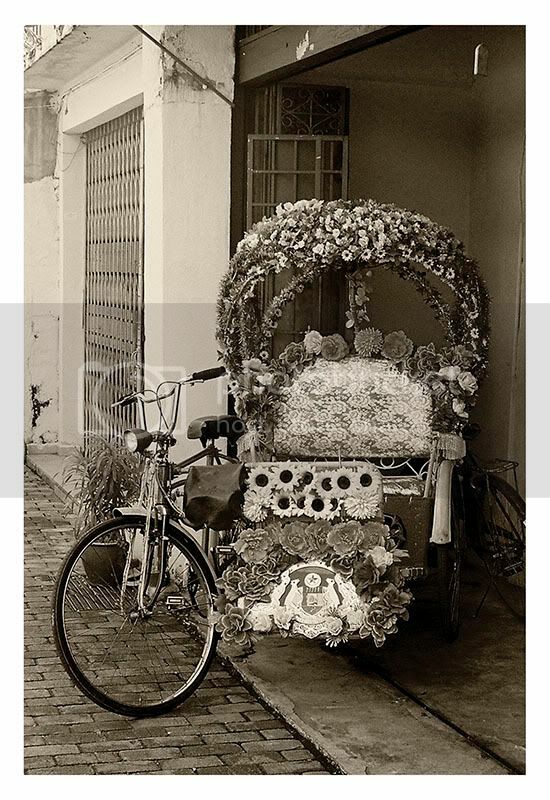 As we walked farther down Temple Street, I saw this parked trishaw outside what-it-seems-like a shop. 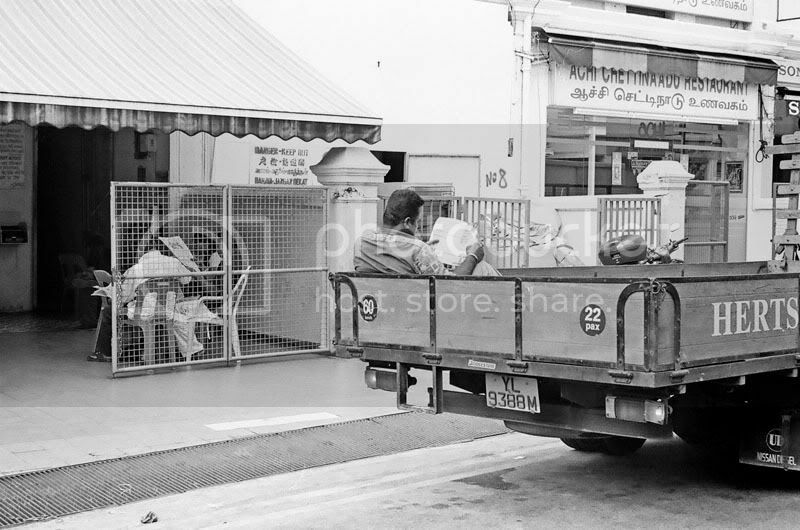 It's the Trishaw Association Company, I think. This is me taking the shot. The hot weather certainly dehydrated us alot. I was thristy and as we reached the 2 temples, I saw this drink stall parked by the road side. 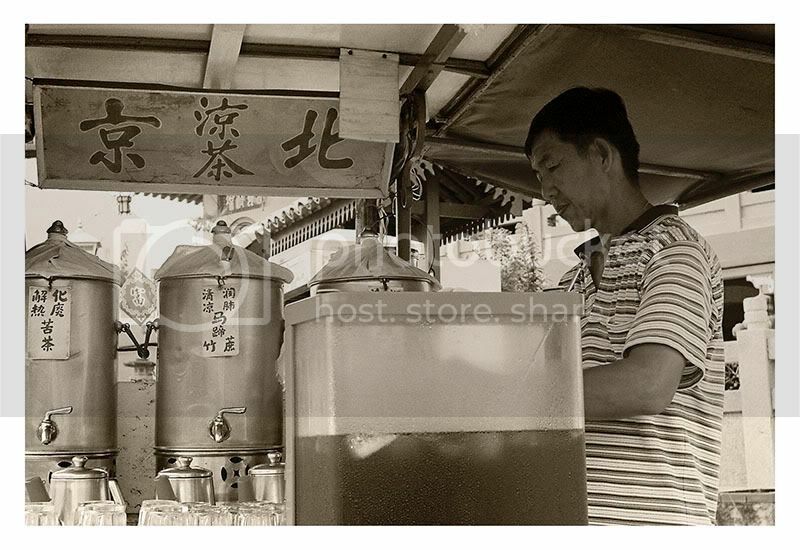 The drink seller is selling herbal tea and other cooling drinks like waterchest nut drink, etc. It costs 1 Ringgit (50 cents) per cup. Ah...! The waterchest nut drink certainly quenched my thrist. Later I asked the drink seller if I can take photo of him. He just smiled and does his work. So I did a few quick shots. This is one of them. After a short rest, we continued to walk down the street, in search of more interesting things to shoot. What a surprise! 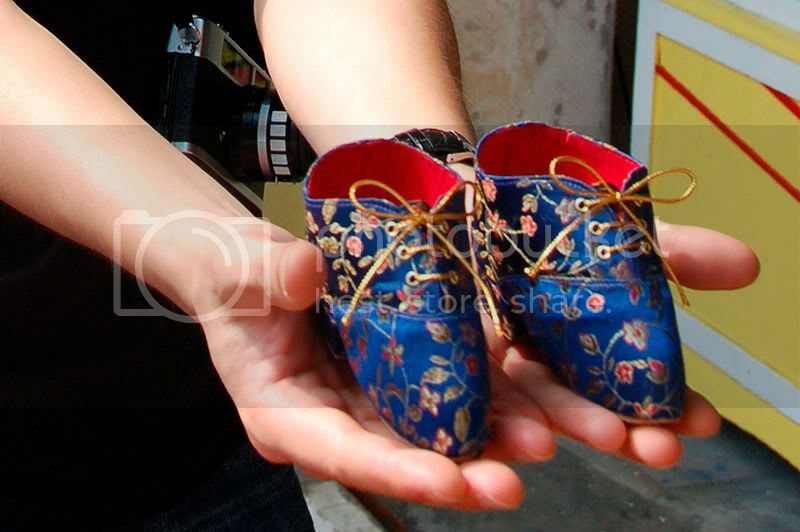 We came across Malacca's famous shoemaker store, Wah Aik Shoemaker. They are famous for the making of traditional bound feet shoes, which they claimed that they are the one and only store that still making it, not only in Malaysia or Southeast Asia but the whole world. Even in China, there isn't anyone making it. This trade/heritage is dying off as no young generations are willingly to learn and make. Wah Aik Shoemaker Store. Courtesy of Vivien Lee. This is how a pair of bound feet shoes looks like. A pair of bound feet shoes measures at 3-inches in length from tip to heel. Well all this heritage has to trace back to history which I won't elaborate here. Bound Feet Shoes on my palms. Courtesy of Stan, Shiwei. 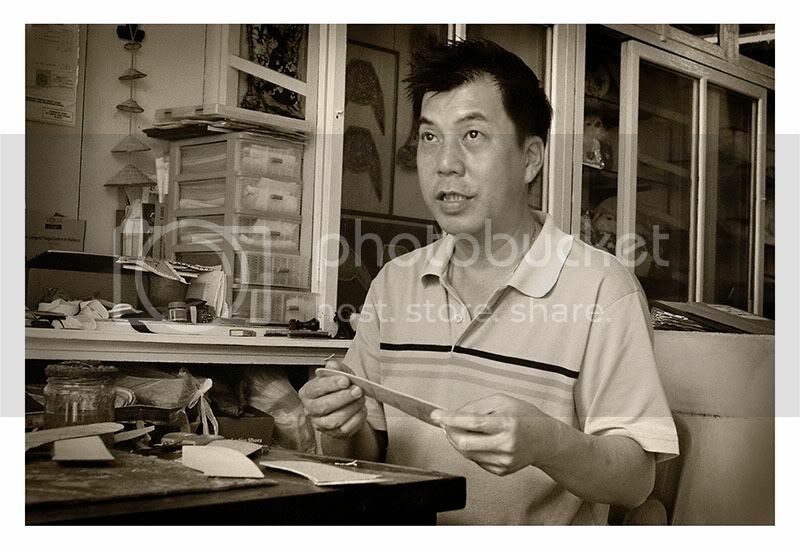 Let's meet the owner and shoemaker, Mr Raymond Yeo. This craft and skill has been passed down for three generations. 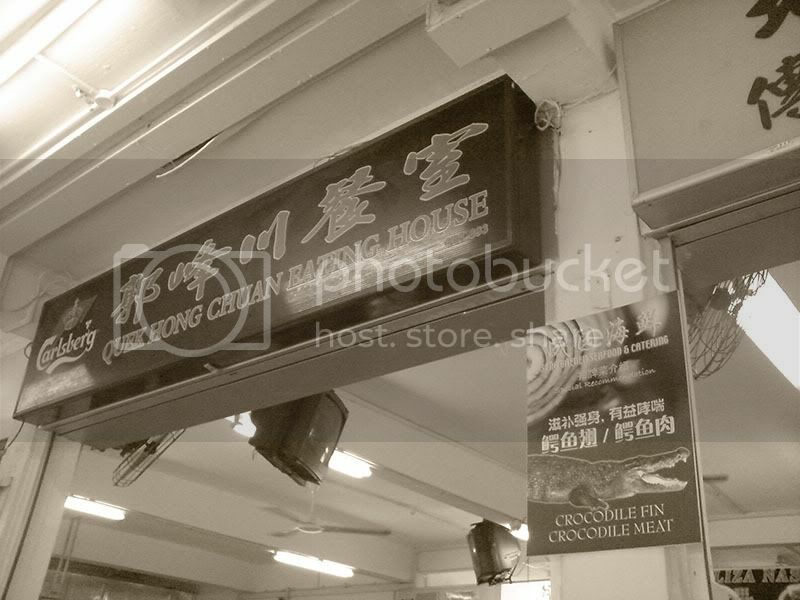 Currently the business is managed by Mr Yeo and his elder brother. 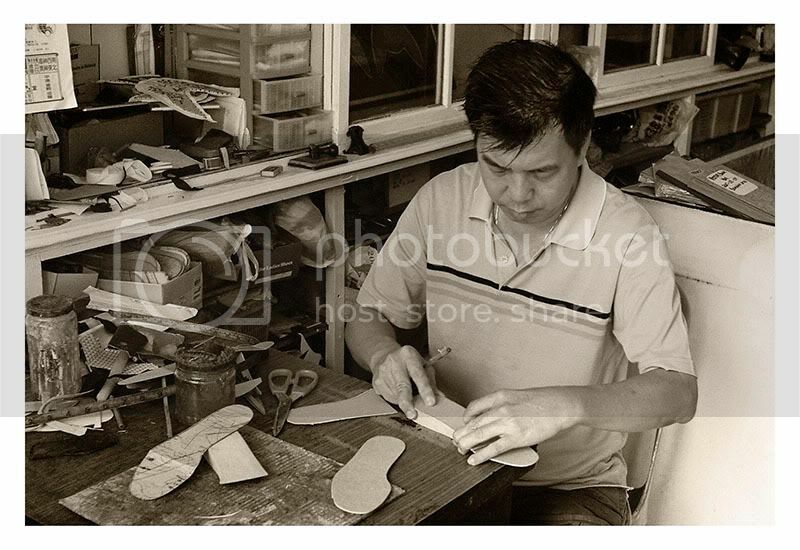 Mr Raymond Yeo, the shoemaker. Mr Raymond Yeo at work. We chatted with Mr Yeo on the history and business of bound feet shoemaking before we bid farewell. 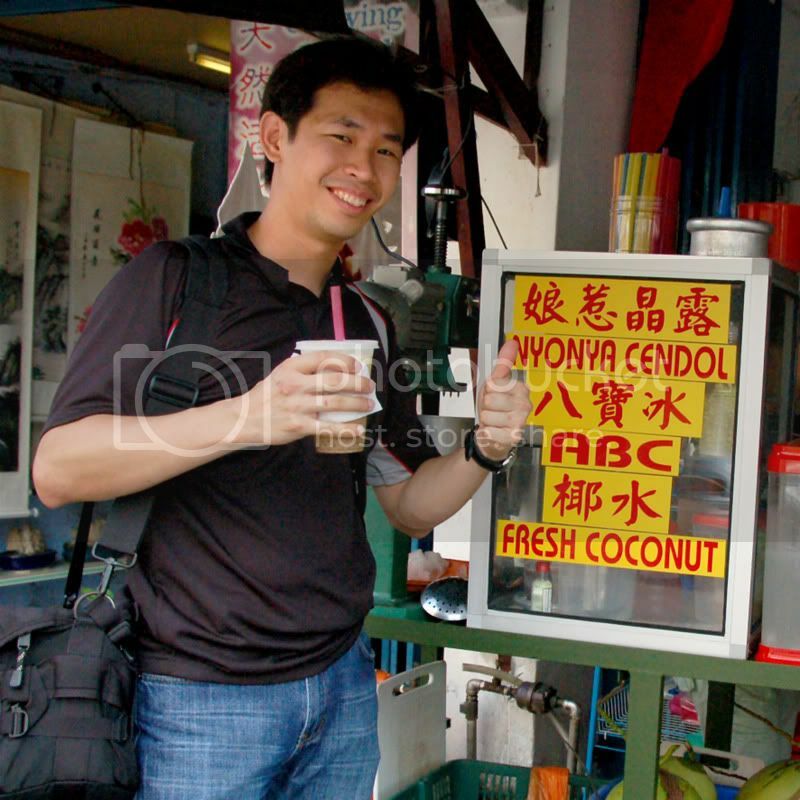 We continued our walk and suddenly we craved for the local famous dessert, Chendol. We stopped by this stall that sells really good tasty nyonya chendol. One cup costs 2 ringgit (about one SGD). The boss told us that they use gula melaka (dark brown coconut sugar) and pure coconut milk, which are undiluted, for their chendol. It's not too sweet and blends nicely with red beans & jelly. Very refreshing! So far this is the best chendol I have ever tasted. 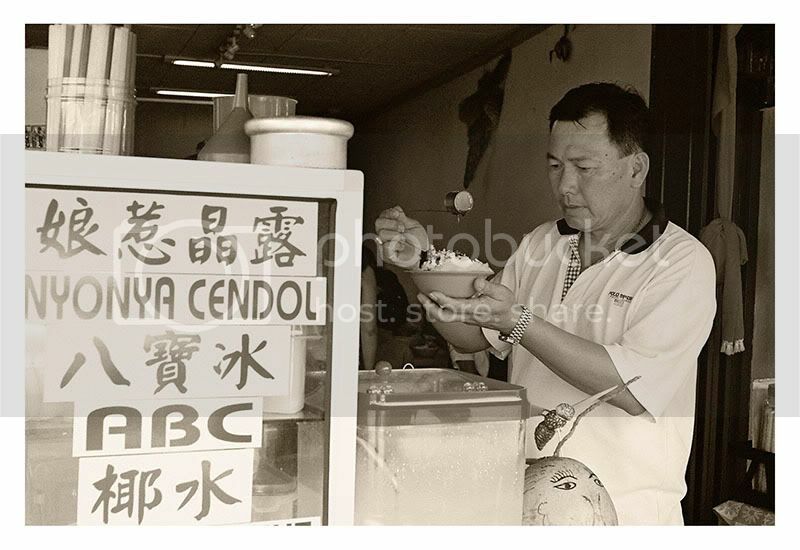 Best Nyonya Cendol in Malacca. Later on, the rest of the guys went on to buy the local famous biscuit，“豆沙饼”. Too bad I didn't manage to get any photos. We went back to the hostel to keep those biscuit and rest for awhile before we moved out again to next location i.e. Portugese Settlement, for some sunset photography. On impromptu, we stopped by at St Paul Cathedral building, one of the tourist sites in Malacca. It's located right on the hill top next to the main road. Upon reaching the top, I bummed into a painter. His name is Martin. I took a closer look at his work and he was doing up a new painting. I decided to have a chat with him. He looked up and smiled at me. Chatting with the Painter. Courtesy of Vivien Lee. 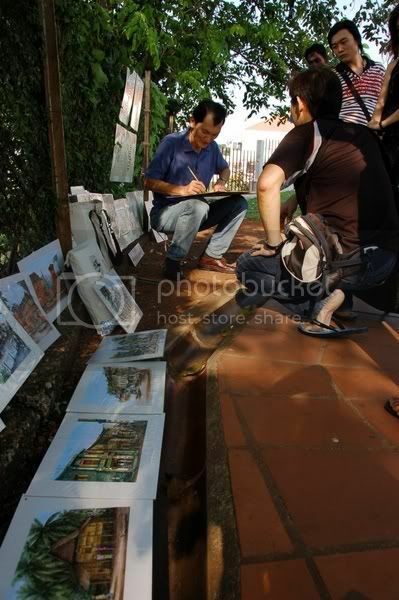 We chatted for awhile before I asked for his permission to take some photographs of him. He seemed to be relunctant even though he agreed so. Therefore I took a few quick shots. Martin the Painter at work. We started to go our way to explore the area for more photography opportunities. There are street buskers and flea market sellers around. Many tourists and including the locals came all the way here for family day outings during the festive holiday. 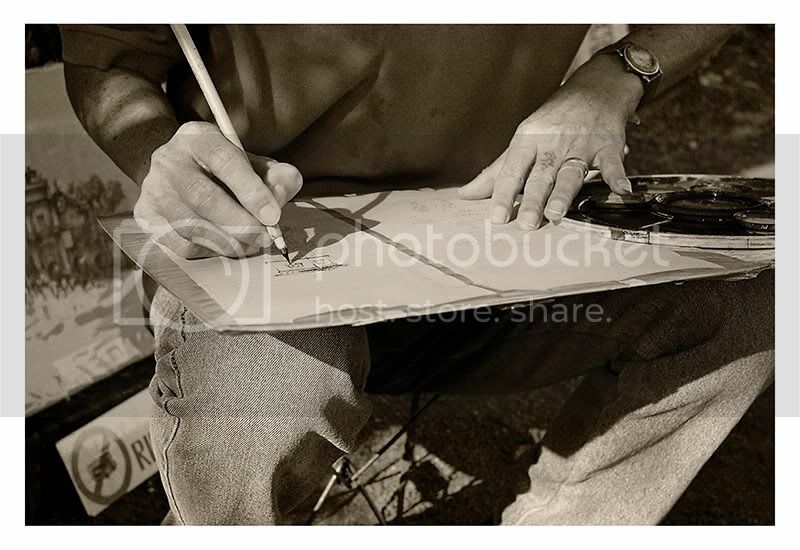 Taking photograph of a street busker. Courtesy of Vivien Lee. 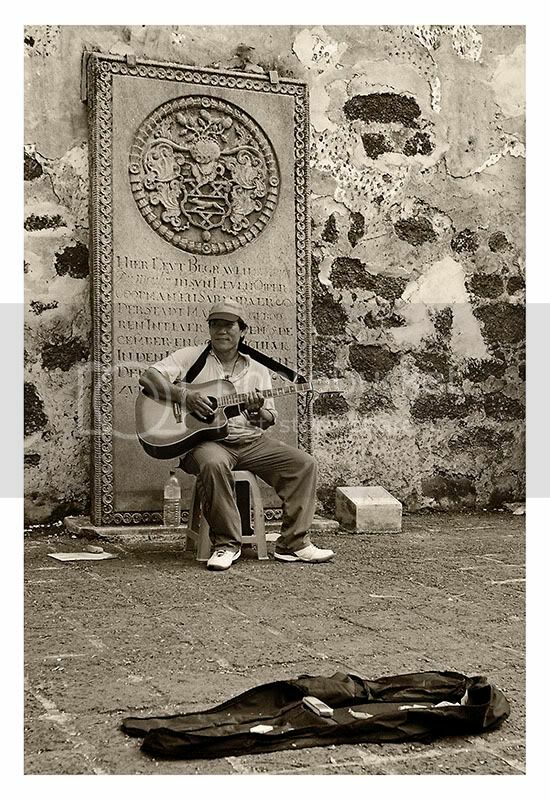 Street busker singing Bob Dylan's "Knocking On The Heaven's Door" . 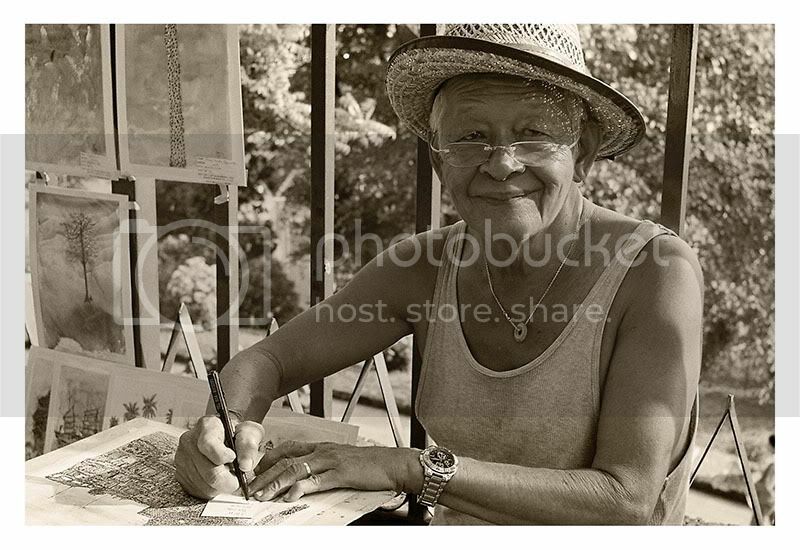 I came across another artist, an old man by the name of Francis. A chatty old folk who was talking to a young lad and his group of friends. As I approached nearer and squatted down, he noticed me and smiled at me. "Go ahead! You can take as many photos as you like! ", he said it out abruptly. I just smiled back at him. Then he turned his attention to me and started to talk about his artwork and even asked me where I came from. In the end, I took a few shots and this is one of them. After asking for directions and reading the map, we somehow decided to walk to the Portugese Settlement. You wouldn't believe it. It was the craziest idea! After a few minutes' walk on the busy street with heavy traffic, we thought that the distance is way too far. We tried to hail a taxi but in vain. We were standing right outside this Club and there was a car with 2 guys, drove up leaving the place. It stopped at the entrance. For the last resort, my friend approached them for direction and asked if they can give us a lift to the Portguese Settlement. They gladly agreed. Whoa! we did actually hitch-hiked a ride. Fortunately we arrived at our destination safe and sound. My personal advice: never hitch-hike a ride in yr overseas trip for yr own safety. You never know what will happen. Never take that risk. Well for us, we were lucky. Based on the car journey and distance, we wouldn't be able to reach there on time for sunset shoot. We were really lucky to meet those 2 kind guys. After staying there for an hour or so for the sunset, we decided to go back to Jonker Street for dinner. We had a good meal at an authentic Nonya Restaurant. After dinner, my friends suggested to go for spa and we went into Hotel Puri to check it out. To our surprise, there was a Christmas carol going on. Well we wouldn't want to miss this opportunity for a few good shots. Here's mine. To their disappointment, the hotel spa service was closed for the day so they decided to go for foot reflexology. I didn't join them but we had supper after their one-hour session. After the meal, we continued to walk around for a little sight-seeing of the night street market til its closing time. 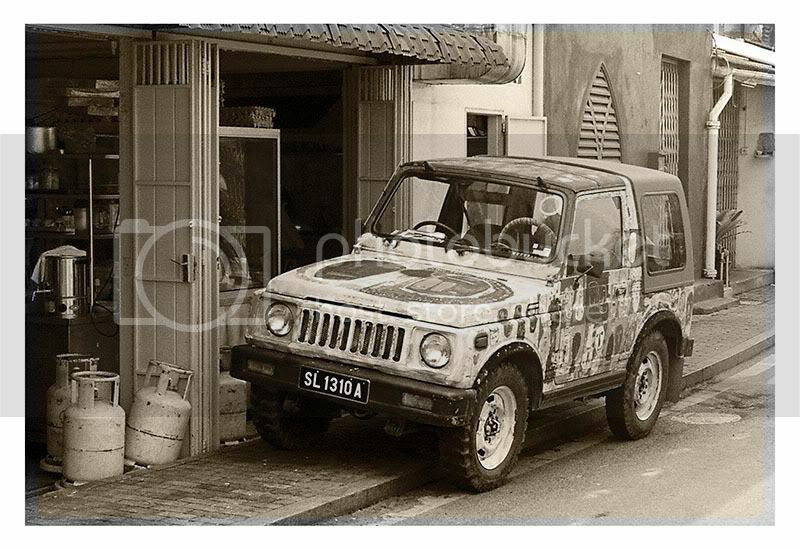 Our last stop was at a pub on a quiet street. We had drinks and a nice chat before we called it a day and retired to our hostel room for cool shower and good night sleep. In the next morning, we had breakfast in-house, provided by the hostel. Simple bread with fruit jam and hot coffee. Over the warm breakfast, we discussed for the day's program. The other 2 fellows decided to go back for more foot reflexology after some walk-around shootings at Christ Church Melaka area. Our group photo (in clockwise from right): Vivien Lee, Stan and me. 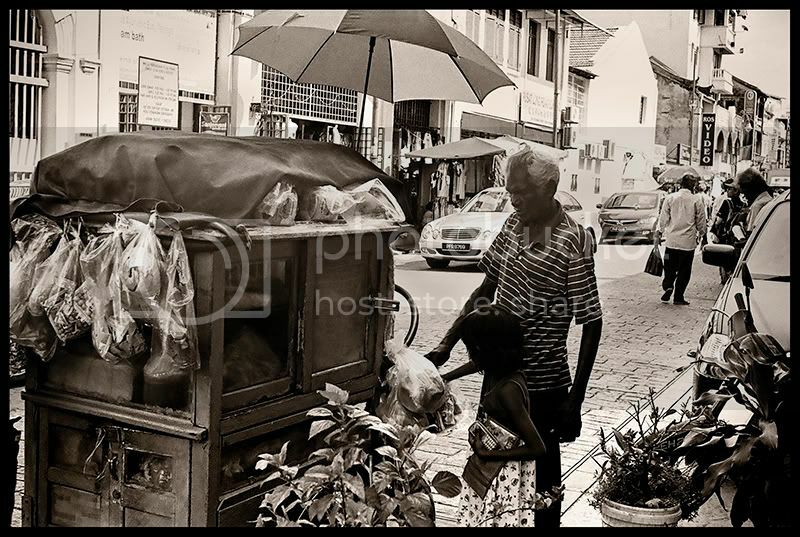 Later on we visited a photography gallery and had Melaka Laksa and Chendol for lunch. Lastly, Vivien and Stan went back for foot reflexology and as for me, this time I decided to try body massage on my back. Whoa! It was really good though painful. I felt much better after the session and the following days to come. Finally we walked back to the pick-up point at Hyatt Hotel and waited for our coach. Overall it was a good short trip which I really enjoyed.